I used to shop at the TCP store for years – and I don’t know about you, but I got out of the habit. What was I thinking? Crazy, right? Thank you to Alma for sharing the new release with me so I could play along in the hop! For my project, I saw the Square Stamp Dies and my mind was immediately intrigued and challenged – how could they be incorporated with some cute coloring of bunnies! Because I knew the Sending You bunnies were on my to-do list, I just love their big floppy ears. I played around with it a bit and came up with a way to create spotlight coloring with nesting dies – you can use any that you already have to get the same effect. But the postage dies with the bunnies delivering mail? Uh yeah. No brainer for me! Watch the video below or click HERE to see it in HD on YouTube. 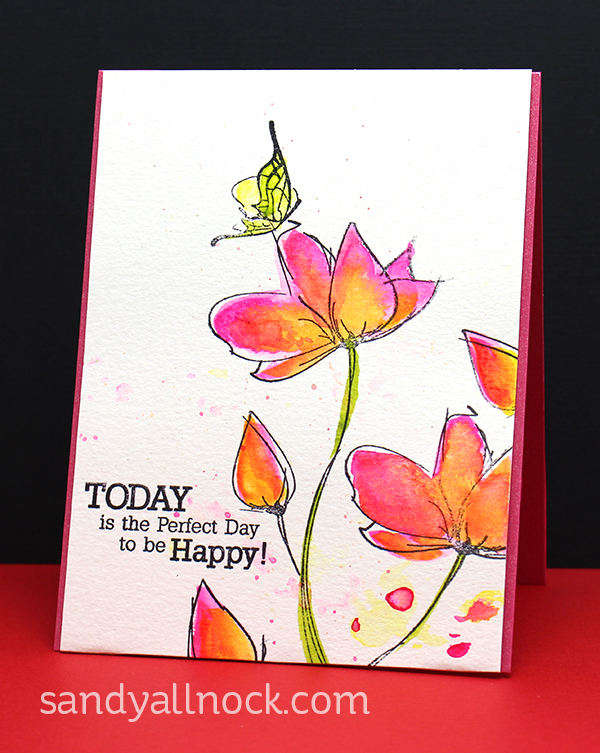 I made cards with a few other stamps in the new release…just couldn’t help myself! Sketchy Flowers set by TCP. Daniel Smith watercolors – Opera Pink, Hansa Yellow medium, Green Gold. Sentiment is from the TCP Friendship set with the penguins. 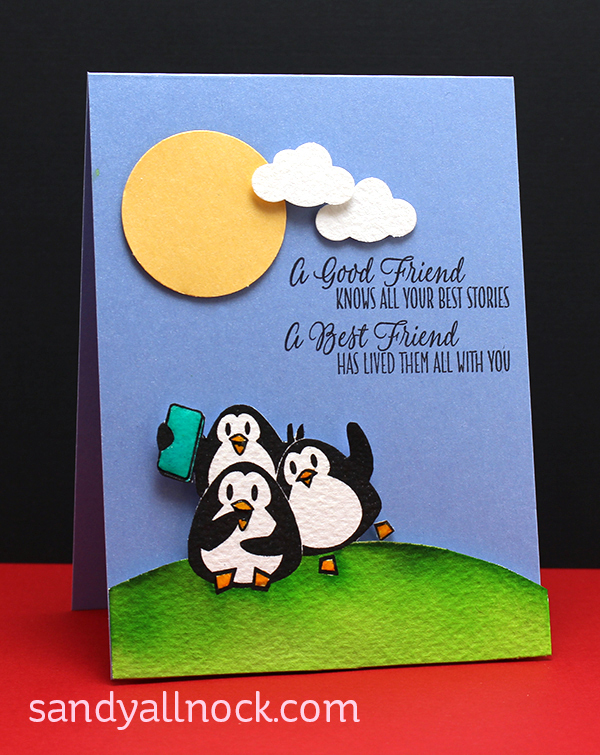 Friendship set – with penguins stamped on watercolor paper, colored with Zig Clean Color pens. I fussycut the penguins and grass and popped on card front. There’s a hop today – go join in so you can see all the beautiful creations with the new release! You can click HERE to go start at the beginning of the bloghop…or click to go see the next one on the list – Christine Okken! Below are links to the supplies I’ve used for today’s video project; click on the listed items to go directly to it. Compensated affiliate links may used, which means if you make a purchase I receive a small commission at no extra cost to you. I truly appreciate your support toward the costs of running this blog! Read more. Those bunnies are adorable! The flowers are beautiful too. What a load of beautiful cards! The first — whimsical (awesome technique), the second — beautiful painting, and then third? Fun! One word, AWESOME!! bunny card I like the card design as well as the coloring. The other cards are very nice especially the penguins…so CUTE! Super cute cards (irresistable) and wonderful coloring! You make it look so easy. Thanks for your sharing time you work so hard to give us. So cute!!!!! Thanks so much for sharing. I’m excited to see more! Beautiful cards. All different and unique. TFS! OMG, Sandy, these are fantastic! Love them all. Those bunnies are cute and the penguins are super cute. Love the flowers too! Great cards. Those bunnies are so cute. I love the Spotlight coloring technique. I am going to have to try it. Fabulous cards! Love them all… so inspiring! The coloring on your Sketchy Flowers card is amazing! Very nice cards! Thank you! As always your cards are beautiful. I just discovered this company and already want to purchase the stamp set. Such pretty cards! Love the great sentiment on the penguin card! Your cards are beautiful. Love all your coloring videos and how you list what marker you are using. Can’t wait for your Copic class to start. Oh, Sandy, what fabulous cards, and I really love these new flowers! Beautifully done! And hehe! I love the penguin card with that great sentiment – it’s so true! LOL! I have one friend who would get quite the giggle over it! Hugs! Love this fade technique. I imagined that you were going to have colored it all the same then coat part with a white pigment ink, but this was better! Wow. Loving it doesn’t begin to express my thoughts. What you did to make this card what it is–is beyond my imagination. Thank you so much for sharing. Sandy, your coloring is always an inspiration! Love the spotlighted bunnies & the flower card is gorgeous! PS – had no trouble finding their store – already ordered some stamps & dies – fun times a-comin! I’d forgotten about these guys, too! But this release came at a good time – I’d been looking for something a bit “different” – and these bunnies certainly fill the bill! You present them in a very fun and different way, as always. Maybe we should add “Imaginator” to your titles!!! These are all great Sandy, totally enjoyed the video. So great tips in there as well. Adorable cards, Sandy!! I just love that penguin one. Deborah’s post isn’t up yet, so it is kind of hard to find you through the hop. Hopefully that will be fixed soon! Such a fun and fa card. Wow Sandy – love the technique and your video is fabulous. And gasp at the two extra cards – beautifully done! Thank you so much for guesting on The Cat’s Pajamas blog hop! Really wonderful! I loved the one with the bunnies and the floral one is also very cute as well. So looking forward to the copic jump start class. Having a hard time finding some of the markers and dont have to many. So clever! Thanks for sharing such a unique way to make a card! Sandy, these are amazing! I’m going to have to try the spotlight technique. Thanks so much for joining us at TCP! So cute!!!!! I’m having trouble finding their store. The link takes me to a website break. Thanks so much for sharing. I’ve never heard of this company before. I’m excited to see more! OMG! These cards are too beautiful. The watercolor card is simply amazing and the Spotlight coloring is definitely one that I will be trying. I love your video. You make it seem so simple. That’s the mark od a great teacher. Thank you so much for guesting on our New Release Blog Hop!